A native of San Francisco, Richard Serra grew up visiting the Marine shipyards where his father worked as a pipe fitter. He has written about the formative experience of watching the launching of the huge steel tankers, in which balance and buoyancy were dramatically tested. 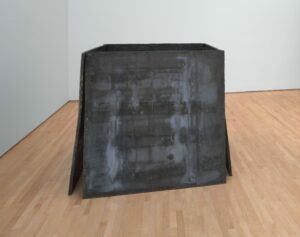 Serra studied at the University of California, Berkeley, and worked in steel mills in the East Bay to support himself. After receiving an advanced degree in fine arts from Yale, he moved to New York in 1966. It was there that he began making art from industrial materials, especially metal. Serra quickly rose to prominence in a climate where artists were reexamining Minimalism's static formal qualities in favor of a more analytical approach to process and materials. 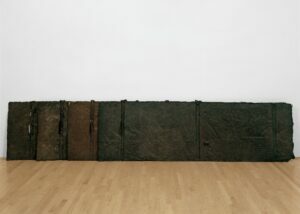 Serra's work took abstract and invisible properties such as weight, balance, pressure, and gravity — all of which are traditionally associated with sculpture — and made them visible and visceral. Examples of this practice include installations of thrown molten lead that use architectural corners as a mold, or metal plates and poles held in place by their own weight. 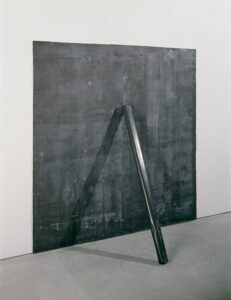 Serra's later career has focused on elliptical forms whose steel surface is intended to change color and texture when exposed to the weather. These site-specific works manifest the same intense physicality as his earlier output, but at an astoundingly massive scale.